Won funding from the Higher Education Funding Council for England (HEFCE) to set up a Centre for Excellence in Teaching and Learning (CETL). Named the Centre for Sustainable Futures (CSF), the Centre's aim was to transform the University from an institution characterised by significant areas of excellence in Education for Sustainable Development (ESD), to an institution modelling university-wide excellence – able to make a major contribution to ESD regionally, nationally and internationally. Ranked second in the then newly launched People & Planet Green League of UK universities. Our first Sustainability Strategy was approved. Achieved ISO 14001 accreditation for our Environmental Management System. Won Silver in the Corporate Responsibility Index from Business in the Community. The cross-institutional Sustainability Advisory Group was formed. The Sustainability Executive Group was formed – reporting to VCE – bringing together the tri-cameral structure: operations, research and teaching and learning. CSF was re-established as part of the Teaching and Learning Directorate after HEFCE funding expired – to champion sustainability in teaching and learning. Ranked first in the People & Planet Green League. Won the Green Gown Award for Whole Institutional Change – Continuous Improvement. Published the first Sustainability Report. Won the Green Tourism Gold Award. The Institute for Sustainability Solutions Research (ISSR) was established to promote the sustainability research agenda, linking 300 academics across the University. 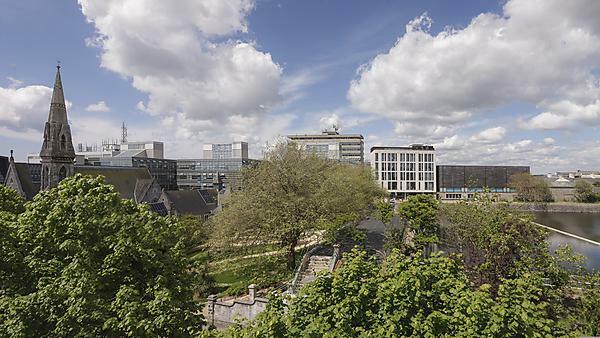 Plymouth was ranked fifth for overall sustainability performance by the international Green Metric World University Ranking, judged against 215 international entrants. First university to be awarded the Social Enterprise Mark. UPSU won a Gold Award in the national Green Impact scheme. Won Silver Award in the national sustainability performance index: Learning in Future Environments (LifE). Sustainability featured as one of the University’s four key ambitions in the Strategy 2020, echoed in the Teaching and Learning and Student Experience strategy. Shortlisted at the Times Higher Education Awards for outstanding contribution to sustainable development. Launch of revised and updated Sustainability Strategy. Special commendation from People & Planet Green League for retaining 'highest performer’ place since its inception in 2007. UPSU was awarded Excellent in the national Green Impact Scheme. Won the prestigious Gold Award from the Royal Society for the Prevention of Accidents. First university to be awarded Three Star standard from the Sustainable Restaurant Association. Bronze award for Food for Life Catering Mark from the Soil Association. Three Green Gown Award wins for: Food and Drink, Enterprise and Courses and Learning categories. The House, the University’s own performing arts centre is opened, built to BREEAM Excellent standard. Renewed Athena SWAN Bronze Award. Drake's Place wins two Abercrombie Awards including the coveted People of Plymouth Award. First in the People & Planet Green League. Re-accreditation of the EMS to ISO14001 for a further three years. Drake’s Place Gardens and Reservoir receives Green Flag. Drake’s Place is shortlisted for the Green Gown Award. Renewed Food for Life Catering Mark: John Bull and hospitality menus gained Bronze and Drakes, Loafers and Reservoir Café won Silver. University creates apiary and sites two bee hives. Sustainable Restaurant Association Three Star standard renewed. Sustainable Earth Institute is launched. Zero waste to landfill delivered. The Guardian Awards 2015 winner for Social and Community Impact. NUS Responsible Futures Award in recognition of the excellent quality of Sustainability Education. Green Gown Award for Sustainability Reporting for our 2016 Sustainability Report. Won the Sustainability Reporting in the Public Sector category at the Building Public Trust in Corporate Reporting Awards (organised by PwC and the National Audit Office). University of the Year at the Food Made Good Awards. Sustainable Restaurant Association 3 stars reaccredited. Named in top 50 UK employers by Bloomberg. University of Plymouth joined the Sustainable Development Goals Accord. University catering have been shortlisted for “Supporting Global Farmers” and “Food made good champion” in the Food Made Good Awards 2017. Drake’s Place Gardens and Reservoir receive Green Flag award for third year running. University of Plymouth Peninsula Schools of Medicine and Dentistry is an Athena SWAN Silver award winner. The University is a Guardian University Award winner in the Sustainability category. The University commits to reduction of single use plastics and signs up to three national campaigns: the WRAP UK Plastics Pact, Plymouth City Councils Plan for Plastics and the Surfers Against Sewerage Plastic Free Waterfront Status. University awarded TEF (Teaching Excellence and Student Outcomes Framework) Silver. The Plymouth Law Clinic – a student run legal service – is a LawWorks and Attorney General Student Pro Bono Award winner for the Best Contribution by a Law School.